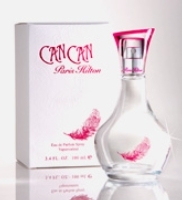 Can Can is supposed to be an "elegant but fun" fragrance, inspired by the Can-Can dancers of the Moulin Rouge cabaret. It was developed by perfumer Jean-Claude Delville. Like Paris's earlier efforts, it has lots of fruits & flowers, but Can Can is meant to take cues from sexier oriental fragrances (the notes: clementine flower, cassis, nectarine, wild orchid, orange blossom, musk, amber and woods). You won't notice from the opening, which is massively sweet fruits over vanilla cake, and invites comparison to Britney Spears Fantasy. Once it settles though, it is warmer and less fruity (and considerably less sweet), and while it never gets dark or sultry, I guess you could say that it flirts with the oriental category. After an hour or so, it smells like a fairly basic woody musk with a bit of pale amber. I first tried Can Can on a test strip in the mall, and found the initial blast pretty horrifying. On skin it isn't so threatening, in fact, I found the dry down rather bland. I find the packaging equally bland, especially in comparison to the print ad. I should think they could have come up with a much more engaging bottle on the Can Can/Moulin Rouge theme. Please add your vote: what was the best celebrity fragrance of 2007? 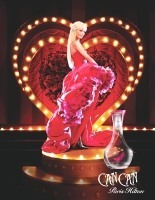 Paris Hilton Can Can is available in 50 and 100 ml Eau de Parfum and in matching Body Lotion and Shower Gel. 1. Via Women's Wear Daily, 7/6/2007. I vote Covet, too. I'm surprised by how much criticism SJP's second scent has taken in perfumanity. I like it and think it's actually pretty adventurous in terms of development (the difference between the top and base notes, how the heart notes almost disappear before the base comes in, etc.) I don't intend to get a bottle, but the whole thing could have been much worse and much tamer. But the criticism, in a way, is a good sign — a polarizing scent is at least interesting, right? Still, it would be really awesome if she would release her dream blend of CdG Avignon + Bonne Bell Skin Musk + whatever the 3rd thing was. Even if just as a one-off limited edition. I was thinking about my voting for basenotes and realized – I haven't smelled most of these yet! In my defense, I almost never see them. All of the celeb fragrances where I usually shop have been banished to the farthest little island in the dept. (almost like lepers…). I did smell the believe lotion and the nicest thing I can say about that was I hope the perfume smells better! Caron has a much better take on the Moulin Rouge theme: French Cancan – a voluptuous white floral bouquet that deserves the name. Perhaps they should sue! I agree with your ranking of the celebrity fragrances – Parker's was the best, and Mariah Carey's and Gwen Stefani's were pretty good, if not terribly distinctive. How nice, where on earth do you shop? Most places (e.g., Macy's, Sephora) these are all front & center. French Can Can is, of course, lovely, but not at all the sort of thing Paris Hilton fans are likely to buy. But I do think they could have done something way more interesting than this! Estee Lauder is front and center, Mac, Lancome & Clinique are on the right, It's a mixed bag (Burberry, Givenchey, Juicy types) on the left, Chanel is north of EL, etc…It's not big enough to speak of, much less compare to Macy's. Also, the men are highly under-represented! * I just practically drew a map, think I've been spending too much time in the perfume dept.?!? LOL! No way! Not being a measurable quantity, how can being overrated be a world record??? I vote for Covet, seeing as how it is the only fragrance on your list that I have smelled. Covet, definitely.I suspect the controversy is that everyonewants and expects dear Sarah Jessica to be pretty in pink and easily likeable. This was a challenging scent as well as packaging and advertising campaign. Just the brown and green colors alone probably wrinkled a few noses. And am I the only one who initially thought the top picture of this post featured a Barbie doll? One of those limited edition collector dolls? Is that really Paris? Looks like Covet is going to win here today! It is amazing how much it looks like a Barbie doll. But if you see a larger image, it does appear to be Paris. Not the most scientific of experiments, but who am I to be a wet blanket. Robin, I really appreciate the fact that you review celebrity and mainstream scents with the same care and detail you devote to more “serious scents”. I personally am completely open minded when it comes to celebrity scents and in general chose my scents on an instinctive simple criteria of whether I like the smell and bottle. From this, my personal fragrance wardrobe runs from the niche, to the natural to the mass market. I have enjoyed a great many celebrity scents this year. My personal list of full bottle purchases have been Covet, M and Midnight Fantasy Based on your review, I am looking forward to sniffing Believe when it makes an appearance in the UK market. I love that celebrity scents, if nothing else, don't take themselves too seriously and often show a great sense of humour. I also greatly appreciate the fact that they are readily available at great prices. Sometimes a bargain gives as great a thrill as an elusive Bell Jar imported from overseas…. In Britain the slew of celebrity scents from Z-list reality TV participants and footballers wives has kept me highly amused. After all who's to say that these people “involved in every stage of the development” aren't just as qualified to front a scent as Bulgari or People of the Labyrinths, neither of whom are traditional fragrance houses. Personally I'd like to see how far we can go: have there been any politicians who have released their own scent yet? An Eau de President Putin, or L'air du Bush might be surprising. I think you might be right though — Guinness Records appears to be a very different animal than it was when I was young (many many moons ago). Entirely agree that sometimes a bargain gives as great a thrill as a bell jar (although — HA — I actually don't have a bell jar so can't be sure). And yes, whatever is going on the UK w/ Z list celebs is highly amusing! Still don't entirely understand why that isn't happening here. But not sure about “if nothing else, don't take themselves too seriously” — I think that is my biggest complaint, is that too many of them *do* take themselves too seriously! Danielle Steele admitted last year that she had nothing to do w/ the development of her scent, but so far, I think she is the only one to do so. Actually you're right, maybe it's that *I* don't take them too seriously. The colour palettes of bright pinks, pastels and glitter from the bottles of products from Paris Hilton and Britney Spears just seem more frivolous and fun than the po-faced approach of certain more upmarket brands. It's not a rule, though – one of my favourites is Hilary Duff's With Love which has a very classic looking bottle and isn't a standard celebrity fruity floral. The French company Robertet seems to be behind many of the more ridiculous British celebscents to hit our shelves, authoring creations from Jordan, Shilpa Shetty, Jade Goody, Kelly Brook …… the list goes on. I suspect it's a good way for them to make some quick cash which is a valid business model. They're bringing out a scent called “Mwah”, named after the sound of a fake air kiss! The face of the fragrance is a young lady who was on the most recent series of the UK Big Brother and comes in the most fabulous looking round red glass bottle. Anyway, I look forward to reading your takes on the more interesting celebrity scents in 2008 – I'm sure there'll be plenty for us to get our noses around. Well good for you then, that is the right attitude! I thought Hilary Duff's With Love was very well done, and much better than much of this year's stuff. Next year, looking forward to Kate Moss (although hear it is not very good — have you tried it?) and we'll see how J Lo does w/ Deseo. And I'm sure a few new celebs will crawl out of the woodwork and join the fun! See, I'm very surprised nobody is doing that in the US w/ American Idol stars or something like. Seems like someone from Big Brother gets a new scent every season. Covet's got my vote, Robin, by a wide margin. Kate Moss has been available here in Canada several weeks now, at the lowest price of any other notable celeb scent. It is singularly unmemorable — light, simple and predictable. The antithesis of the celeb herself! I wonder what she wears in *real* life? Anyone know? Yeah, that's what I hear: unmemorable. Too bad, because I do think she could have sold something edgy. Ah well, another one bites the dust. Hooray for Covet! I really like it and will probably wind up buying myself a gift set over the holidays. Just sampled Kate Moss today. It is fruity, floral and instantly forgettable. I appreciate that most of the celebruty scents are quite wearable. I remember trying Victoria Beckham's Intimately and SJP's Lovely a while back and thought they're both quite nice (although predictable). At least they don't remind me of insecticides and I had no urge to wash them off then. Kate Moss has been quoted in the press as being a fan of Penhaligon's Bluebell. I haven't smelt it but believe it's a simple linear soliflore scent. I have smelt the Kate Moss fragrance and unfortunately can't add anything more as I also found it really boring. Is Kate Moss fruity too?? I thought it was supposed to be a dark rose? Will have to go look up the notes again! I've heard Bluebell too. Seems like an odd fit w/ what little I see of her public persona. But have also heard one other scent she wears, although of course I don't remember what it was. SJP Lovely was very well done. Haven't been able to try any of the Beckham scents yet, although I'm pretty sure they're in the States by now. And yes, Jade Goody's apparently did quite well before they pulled it! Sorry to be purile but I remember a thread on Basenotes.net that started with the innocent question “Has anyone tried Paris Hilton's Can Can?” and caused enormous mirth and some very witty scurrilous comments. Every time I see Paris Hilton mentioned it now makes me giggle. L'Heure Blue is the other one she's often been quoted as wearing. The girl has good taste. Her fragrance? It's OK. Doesn't make you go wash it off or anything. But nothing interesting. It's a mass-market frag that doesn't want to offend. And I bet thousands of teenagers/twentysomethings will be getting a bottle this Xmas. Fair enough – she's built her brand and she's aiming for the bucks not the kudos. Maybe in a decade she'll be settled as a designer and will be able to release things that are more interesting. LOL — yes, then there's THAT aspect of the name. If you didn't catch her appearance on David Letterman, worth checking out on YouTube. My vote is for Can Can. Still sweet, but calmer. My tastes may be starting to grow up!! ‘M’ was my favourite of the year beforehand. I also liked ‘Midnight Fantasy’, but it got a bit sickly. ‘Covet’ was ok. I found ‘L’ to be quite boring. ‘Stunning’ was too strong, and was an ‘Angel Innocent’ clone, as was ‘Sweet Darling. ‘Unforgivable’, ‘Kate Moss’, ‘Shilpa Shetty’ and ‘Christina Aguilera’ were all short-lived ‘messes’ – I couldn’t single out any one individual note. ‘With Love’ and ‘Glow’ are probably my favourite ‘Celebrity’ scents, because they’re different from the rest. ‘Paris Hilton’ and ‘Heiress’ are quite good too. Only 2 days ‘til Las Vegas now. I’d better like ‘Believe’. But you got to smell lots that I didn't: Stunning, Sweet Darling, Kate Moss, Shilpa Shetty. And have a great time in Vegas!!! Perfect time of year to go. If you get to the Venetian, there is a lovely Acca Kappa boutique there. I would definitely be interested if Ukrainian politician Julia Timoshenko launched a fragrance – her style is fantastic, and definitely out of the common way. A Putin fragrance might fare well, considering his popularity… don't know if Bush can sell anything at this point, but apparently Britney Spears name still sells, in spite of everything – who knows? If you want those sorts of things, you've got to go w/ Coty or Elizabeth Arden. Parlux is “fast & dirty”. I love covet, but I must use up a few bottles before I purchase any new juice, per Hubby's request…..
Just a side note, if you like Glow, try China Lily, by Nectarine cosmetics. They make “brand” fragrances for other companies and also sell to stores that do custom blended body products. Glow is also pretty darned close to “China Rain”, by either Terranova or Body Time. I LOVE Can Can! I'll Get The Big Bottle and the lotion when I Smell Deseo! Are you waiting to see which is better, Can Can or Deseo? LOL — no, you don't, and I'm surprised you've waited this long for Can Can when it's been on counter for ages! Anyway, you'll probably know before I do when Macy's gets Deseo, as usually it's on counter a good week or so before it's online. Completely agree on the bottle — it is very disappointing. I must be in a pessimistic mood. All her fragrances are the worst of the worst hands down! Do they even smell the final mixture before releasing these to the public? One of her concoctions, maybe Paris, princess or whatever turned me off so badly I will not even dignify her fragrances by smelling them. Did anyone else find that? To some extent, the themes used in celebrity fragrances are so similar that many of them remind me of others — so in that sense, yes, can see it as a more robust and fruity version of In Control Curious. Well, I can't really say which one is the best celebrity fragrance of 2007 as the supply of perfumes here is extremely limited even if I visit practically every perfume store in town, but I'd have to say my vote is for either Midnight Fantasy or Can Can. I like With Love too, but not quite as much as the previous two. Strangely enough, I'm not THAT fond of 'M' – it does have a nice scent, but yeah… I'm more fond of sweet scents. I found heiress too sweet – it actually reminded me of love at first glow.I love Can Can – I think it's distinctive but wearable even if the bottle is bizarre! I'm not really sure why I bought Just Me… I like it but am never brave enough to wear it! I liked Paris Hilton's original, but I can say I wasn't that impressed with her others. I did buy a mini bottle of Heiress, but quickly got tired of the “bubblegum” vibe. “Just me” is horrifying when first on skin, but the dry down is nice. even though they are older releases, i'm in LOVE with “Lovely” and “Armani Code” for women. I like the Lovely & Armani better than any of the Paris Hilton scents myself. I think it smells a bit…chemical! almost like it's not even a perfume! ha. I'd say her first perfume is her best one for daytime and cancan for evenings and going out. I got Can Can recently and I found it to be a kind of fun scent. In some ways it reminds of Britney Spears original Fantasy in that it has hints of a fruity basis but there are other factors in CC that make it stronger and unique. I still prefer Fantasy over CC though even CC is an ok scent. was thinking today that the bottle (Cancan) could be better…I've got the 100ml and it's actually quite hard to spray cos of the odd shape!